Posh striker Joe Gormley picked up an injury in a reserve team friendly against Norwich. Photo: Joe Dent/theposh.com. New Peterborough United manager Graham Westley believes his assistant Grant McCann has laid the foundations for a surge up the League One table. Westley manages Posh for the first time tomorrow (September 26) in a League One match at Bradford City. He takes over a team who have taken four points from two matches under the caretaker-management of McCann. Westley has been careful not to change much since officially succeeding Dave Robertson as the club’s permanent boss on Monday (September 21). 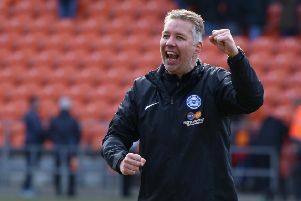 He will adopt a patient approach as Posh make a concerted effort to get into the League One promotion race. “We can build on Grant McCann’s platform,” Westley said. “My job is to forge the team into a unit capable of getting over the early-season blips and get us challenging towards the top of the table. “We are currently playing at a good level. We played outstandingly well at Oldham and we played some decent football against Walsall. The lads are enjoying Grant’s coaching sessions and it would be silly of me to march into the club and stamp my size nines all over the place. “Continuous improvement is what we need. We have taken four points from the last two games and if we average two points per game all season we will most probably be in an automatic promotion place. “Obviously that’s a long way off, but if we are patient we can get there. There is a lot of ability in our squad as we have shown in the last two matches. We probably could do with more thrust in our attacking play, but that will come. “Bradford City is a great place for me to start. It’s a great place to play. They introduced the cheap season tickets the other year which guarantees a big crowd and a great atmosphere. “The playing surface is good and I can’t wait to get started. You don’t become a manager, player or fan to talk about training, you want to experience the buzz of matchday. “Bradford are a good side. I watched them draw with Sheffield United last weekend and they played well. They have the big lad James Hanson up front and they have the pace of Devante Cole to run off him, but they also use their wingers well and they pass the ball well. Westley is expected to bring his former Stevenage player Michael Bostwick back into the starting line-up in place of suspended midfielder Jermaine Anderson. Striker Joe Gormley picked up a knock in the reserve team match at Norwich City this week and is rated doubtful. Goalkeeper Ben Alnwick will retain the captaincy at Bradford, but an outfield player may take over soon. Westley is happy with Alnwick’s influence, but he’s unsure a goalkeeper makes the ideal skipper. Central defender Jack Baldwin is still a couple of weeks away from a return to first-team action. Left-back Kgosi Ntlhe is expected to be on the sidelines for a further six weeks.